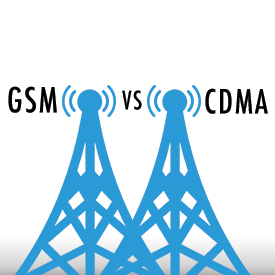 GSM vs CDMA – what is the difference and why should I care? US Mobile currently only operates as a GSM network. What does that mean? Well GSM networks like US Mobile, T-Mobile, and AT&T use removable SIM cards. This means that unlocked phones from other American GSM carriers will work on US Mobile’s network. On the other hand, Verizon and Sprint are CDMA carriers. CDMA carriers don’t use SIM cards and most CDMA phones are locked into their network. So you can’t use a Sprint phone on Verizon’s network or vice versa. Also, many CDMA carriers don’t allow you to do voice and data at the same time. However, CDMA networks tend to have better network coverage in rural areas. LTE, is a 4G wireless technology, developed to achieve high-speed data. All LTE networks in the US are using GSM technology, as CDMA Technology can’t handle LTE. Due to this, newer Verizon and Sprint phones all use a SIM card. Seeing as all new phones aren’t using CDMA, the question is if CDMA is on its way out completely? If you’re planning on bringing your GSM phone to US Mobile you can find more information in Is My Phone Unlocked. Can I Bring It To Any Network?. Or if you’re looking for a new phone, check out our webshop for unlocked phones. How to Find Your Carrier Porting Information? Is US Mobile a GSM carrier?